Finished Feb 2018. Final score: 5 / 5. There is a Spielberg movie based on this book about to be released. I wanted to read the book before seeing the movie. This book has it all: action, adventure, a good hero, obscure geek references, and a satisfying ending. How did this book fly under my radar? It took a big budget Spielberg movie to bring it to my attention. I've been craving a good sci-fi / fantasy book for months. One that is, simply, a complete sci-fi book. I want a beginning, a middle, and end. Not an attempt to launch another series. Not something trying to teach me a lesson. I want a hero in the middle of a dystopia. And I want to know the ending when the book finishes. 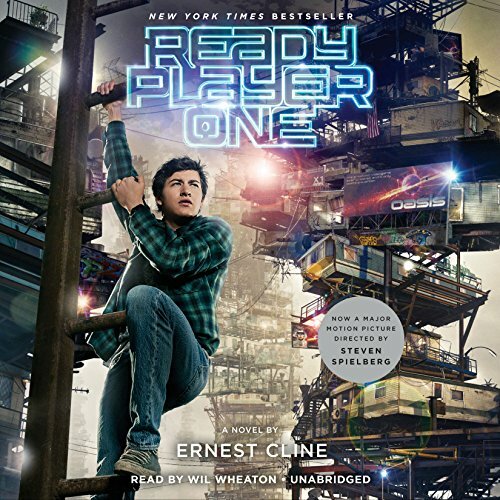 Ready Player One delivered everything I, a sci-fi fan, wanted. We have a young man who is the nerdiest of nerds. This kid has been living, breathing 80s movie and video game pop culture for 5 years non-stop, and it shows. It is laden throughout the book. What I really like about this hero is that his rewards are actually earned. Often, the sci-fi hero has no legit claim to his reward / powers. They simply won the birth lottery, or an amazing item just fell from the sky. Our hero paid his dues to be able to pass the challenges. If I had to pick a negative, it is that most of the endless geek references were past my time. I was too young for the early 80s. This book is begging to be reworked with early 90s pop-culture. Note that I had the same complaint about Replay, but I still gave it a 5 too. I'm curious if the movie version shifts the timeline to the future (so we see more Nintendo than Atari), much like the book It shifted its timeline for each movie release. The general premise is that everybody in the world is living their lives plugged in to The Matrix (by choice, mind you. This is like the non-game Second Life gone global and with VR). The creator has left an Easter Egg in his game/simulation. Whoever finds it will be awarded billions of dollars. An evil corporation has sprung up and is spending big money to find the Easter Egg. Our hero is flying solo against Big Corp. In his travels, we are treated to a wonderful ride of fighting, puzzles, interesting virtual worlds, an interesting dystopian real world, true frustration, and on. Really, there is nothing missing in this book. It is all well done. Well, except for the chapter where the hero courts his love interest. It was more cringeworthy than cute, but I am giving it a pass. It is not the focus on the book. It is merely a semi-important plot element. And finally, to my enjoyment, the book ends with all the story arcs resolved. I'm placing Ready Player One in my best-of lists. It deserves its hype. Discuss Ready Player One in the forums.